The Clarendon is a privately owned country restaurant with a stylish twist, located down the Hertfordshire lanes. Salix came well recommended with a good reputation. It allowed us to have a no worries, one stop kitchen solution. After initial meetings it was obvious that the Salix team were very experienced with huge enthusiasm. 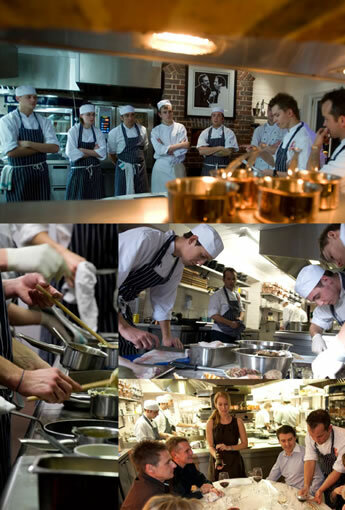 This was important to us as we wanted to work with experts who could really add value to our restaurant. We gave them a blank canvas to work closely with the design and build team, Salix took responsibility for the planning of the kitchen and its services. As a start up business budgets were really tight but our standards were high and they took this into account. Our bespoke kitchen was designed to deliver a refined menu to the required number of covers. It also had to include a chef’s table area that was visible from the main restaurant. Jayson listened to this and came up with a solution which was to negotiate the purchase of TV’s hell’s kitchen which was then modified and installed to suit our purpose. Salix were integral to the design process and worked through every detail with the chef. In addition they provided an invaluable insight on technical detail and efficiencies. There was a problem with the air exchange system and no one really knew how to solve this. Jayson had a look and after some thought came up with the correct solution. We made plenty of changes throughout the process and Salix took these on board and worked with them. The team were very easy to deal with, like working with good mates. They are used to working with chefs and were also able to work with me and keep me happy. As an owner I am a difficult sod as I have high standards. On a few occasions Jayson got involved and said we would hit all the agreed deadlines, telling us not to worry. I know he and his team worked around the clock to achieve this.